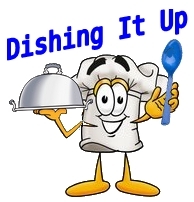 Welcome to the June Dishing It Up Recipe Hop Giveaway! June's theme is "Barbecue and/or Picnic Foods" and my contribution is Quick Pickles. Everyone knows that you need pickles available for folks to nibble on while they are waiting for their food to cook on the grill. Here is a recipe for pickles that taste like summer to me.